- All photos by Jim Mason The 4 1/2 square miles of Maxwell Wildlife Refuge and adjacent McPherson State Fishing Lake provide one of the best viewing opportunities in the state for large mammals. 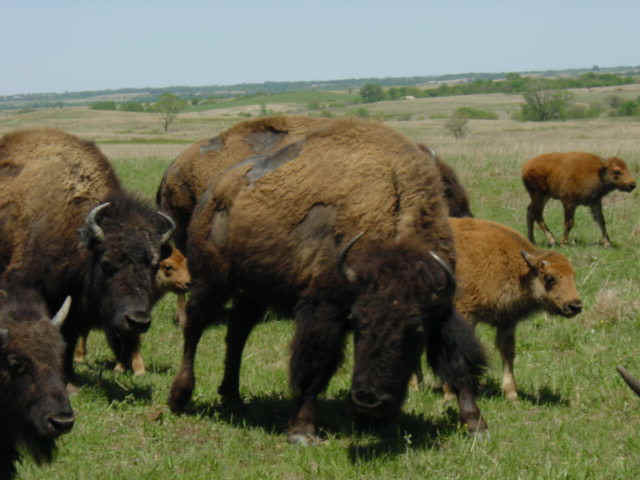 Today at Maxwell approximately 200 bison and 50 elk give visitors a rare look into the past. 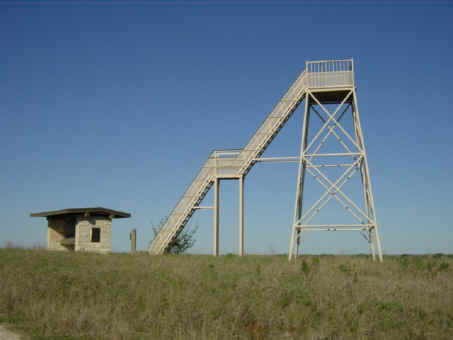 The observation tower (red dot on map below) is a good place to scan the rolling hills for wildlife. Visitors on the refuge are not allowed to leave the roadway by vehicle or by foot. 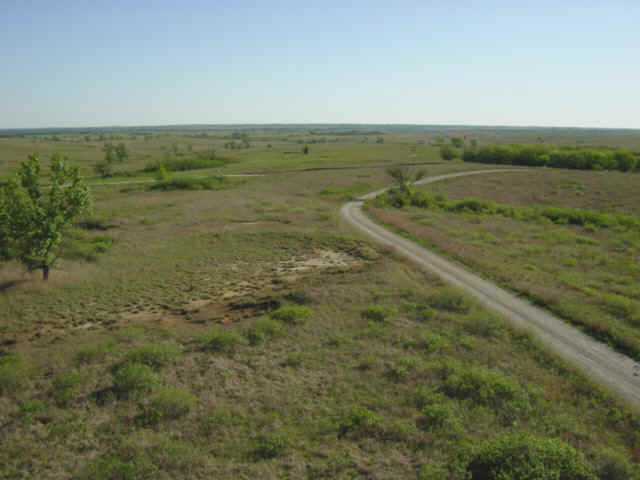 A portion of the road through the refuge is open range. If bison are near the road, view them only from the safety of your vehicle. The bison can be seen up close from the tram. For a modest cost the private group "Friends of Maxwell" offers guided tram rides onto the Refuge to see the bison. These are available on Saturdays at 10 AM by appointment. Call (620) 628-4455 or visit their web site listed below for more information. Also see their special event list. 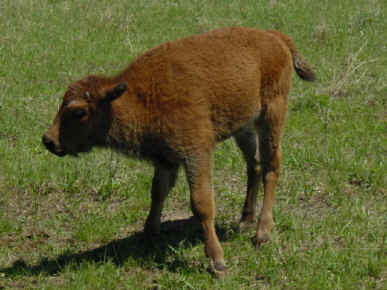 New calves are rusty brown in color. They change to the darker adult color by fall. Calves are born from late April through early June. One of the most impressive times to experience the elk is during the breeding season, or rut. From mid-September until mid-October the dominant bulls are gathering cows into harems. Their bugling can be best heard on calm mornings and evenings. McPherson State Fishing Lake The area around McPherson State Fishing Lake (46 surface acres) is ideal for prairie wildflowers. In May and June there are impressive displays of yucca, spiderwort, yellow star-grass, catclaw sensitive brier, purple prairie clover, coneflowers and the uncommon Virginia Tephrosia. Abundant butterfly milkweed attract insects and butterflies, including the large, rare, Regal Fritillary. An eastern bluebird "trail" of numerous nesting boxes attached to the fence provides an opportunity to see these attractive birds. While traveling the roads or exploring the prairie be alert for the plentiful ornate box turtles. Lizards such as six-lined racerunners and legless slender glass lizards are also found here. Common snakes include black rat snakes, gopher snakes, and prairie king snakes. At the southwest corner of the lake is the Gypsum Creek Nature Trail. Watch for white-tailed deer, cottontail rabbits, fox squirrels, and woodland birds. Beaver sign is impressively abundant on this trail. If you walk slowly and quietly at night and use a strong flashlight you may gain some insight into the secret life of the largest Kansas rodent. Primitive camping at the lake & 1 cabin (make a reservation online). Directions: From Canton (50 miles north of Wichita) travel 6 miles north on McPherson County 304 to Pueblo Road. 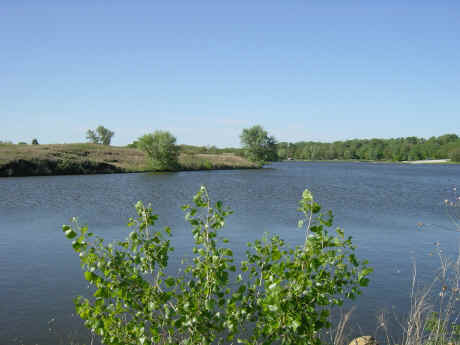 Ownership: The entity responsible for management of Maxwell Refuge and McPherson State Fishing Lake is the Kansas Department of Wildlife, Parks & Tourism. Contact them at (620) 628-4592 if you have specific questions about use or management of these sites. You may download the KDWPT brochure for Maxwell Wildlife Refuge and McPherson State Fishing Lake from their web site. The Friends of Maxwell hosts several special events during the year. Here is the 2012 schedule! or self-guided tour with flagged flowers. Demonstrations of 1800s lifestyle, primitive camps & traders, buffalo tour, concessions, music. Buffalo tours are available year-round by reservation on Saturdays at 10 AM, no minimum group size. Adults - $8, under 12 - $5 Call 620-628-4455 to make a reservation.